Nothing prepared me for the venom in his eyes. While not directed at me, nobody in the courtroom could escape the anger seeping from his pores. 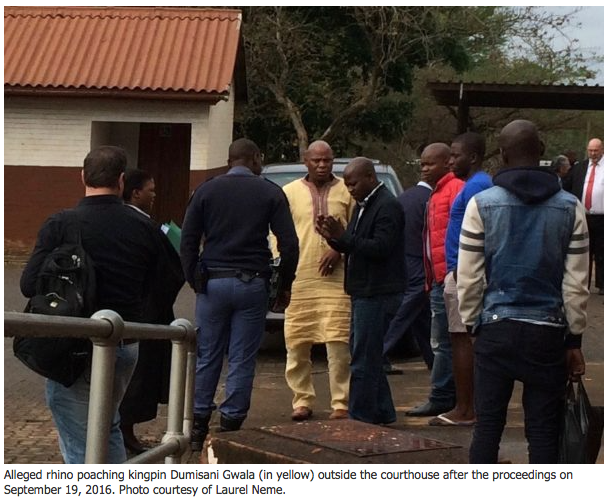 Through a twist of fate, I was in KwaZulu-Natal (KZN), a province on the eastern coast of South Africa, on September 19, the day the trial of a suspected leader of a rhino horn trafficking syndicate, Dumisani Gwala, and his two co-conspirators was scheduled to begin. Arrested on December 18, 2014, after a weeks-long sting, he reportedly is “the leader of KZN’s biggest rhino-poaching syndicate,” with about 80 percent of illicit horns in the province passing through his hands. “He is brutal and rules by the gun. He is often the middleman between the poachers and buyers, but he also organises poachers in Mozambique and locally and provides them with weapons,” Barend Lottering, head of the private, regional Nyathi Anti-Poaching Unit told South Africa’s Sunday Tribune at the time of the arrest. 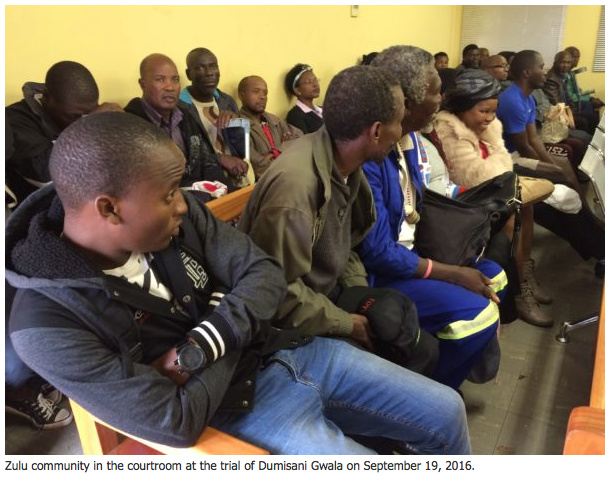 Out on bail of reportedly R10,000 (roughly $865), Gwala’s trial had already been postponed several times. The most recent was a couple weeks earlier, when Gwala changed his defense counsel in what I learned is a common delaying tactic. When I entered the courtroom at the Ngwelezane Magistrate’s Court near Empangeni, I didn’t know if, this time, the trial would proceed. In a nutshell, here’s what happened. At the stated 9 a.m. start time, Gwala’s latest attorney was nowhere to be found. After 15 minutes of disarray, the hearing started with the defense attorney of the two co-defendants withdrawing and a request for another postponement because of this change in representation. At around 9:30, Gwala’s attorney showed up. She offered an apology but no explanation for her tardiness. Then she too asked for a postponement, saying she was unprepared and needed more time—a repeat of her request from two weeks earlier, when she also asked for more time. As I followed the legal maneuverings, I looked around the simple courtroom. It was packed. About 40 members of the Zulu community, both men and women, filled the three rows of seats in the stuffy room. They wanted justice for their rhinos. 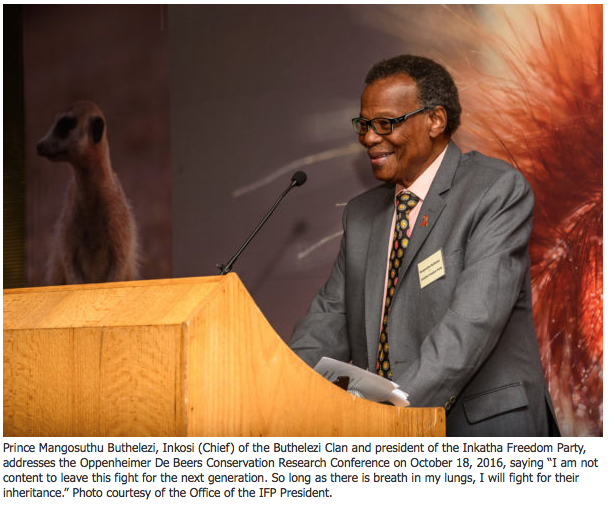 Buthelezi has fought to protect South Africa’s rhino population since the 1970s. At that time fewer than 500 white rhinos remained, and he worked closely with conservationist Ian Player to grow their numbers. He also withstood pressure from the National Party Government to turn Zululand’s game reserves into agricultural holdings. But this was not the day. The prosecutor lamented the numerous postponements. “The delays caused by several changes of attorneys is not in the interest of justice,” he argued. The magistrate agreed. “This cannot be allowed to go on and on,” he said. He reset the trial for October 21. Poaching in KZN is on the rise. As anti-poaching efforts have had success in South Africa’s number one target—Kruger National Park—poachers move to softer ones such as KZN and the Eastern Cape. As of October 17, 126 rhinos have been killed in the province, according to Musa Mntambo, communications services manager for the provincial government environment authority, Ezemvelo KZN Wildlife. That’s more than a 30 percent increase over the same period last year, when KZN lost 96 rhinos. The vast majority (about 70 percent) of those come from the provincial Hluhluwe–iMfolozi Park—which is where I headed after the trial. 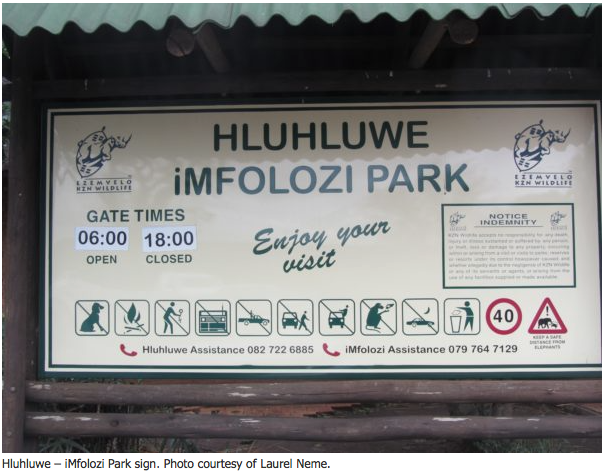 Hluhluwe-iMfolozi Park has a long history. It was the royal hunting ground of Zulu King Shaka and other kings, and it has a high concentration of rhinos. Ezemvelo KZN Wildlife has put much effort into its anti-poaching initiatives—including drones, redeployment of additional field rangers from non-rhino reserves, and patrolling along the more than 11-mile corridor road. So far this year arrests have almost doubled, to 98, and 51 firearms have been confiscated, compared to 48 arrests and 25 firearms seized over the same period in 2015. But security is challenging. The area is remote and covers some 370 square miles. Access is controlled at a manned entrance gate, where we filled out some paperwork. The forms would be crosschecked at our exit. I couldn’t help but wonder what it would it take to circumvent the procedures. There have long been whispers of complicity of insiders throughout the chain—from safari guides and rangers to those in the legal system—and there have been some troubling examples. For instance, last July in Kruger National Park, a regional ranger was arrested for poaching by his own field rangers. Field guides and traffic officers in Kruger too, have been arrested. I thought back to Gwala’s non-trial. After the proceedings had adjourned, he and a policeman appeared to be laughing and chatting outside the courthouse. I stayed in Hluhluwe game reserve for several days. On my last night there, September 21, I heard two separate sets of gunshots. At 10:38 pm I heard about 12 rounds. The shots were sporadic. First three. Then two more. I tried calling reception to notify someone but nobody answered. They close at 10 p.m.
Five minutes later I heard three more shots, followed by a burst of four or five more. Then silence. Was one of the rhinos I’d watched grazing earlier that day now lying dead? How many died because of the postponement of Gwala’s trial? I couldn’t sleep and at 2:35 a.m. heard two more pops. Happy World Rhino Day, I thought. In the morning I asked the staff at the lodge what had happened. They dismissed my concern—perhaps simply not wanting to alarm a tourist. I later learned that on September 22 at least six rhino carcasses were discovered in the reserve. According to Mntambo, two had been killed two to three days earlier. Were there others not yet found? This Friday Gwala’s trial will resume. Again, members of the Zulu community intend to be at the courthouse—acting as “family” of the victims. They want justice for their rhinos. But what will happen is anyone’s guess. 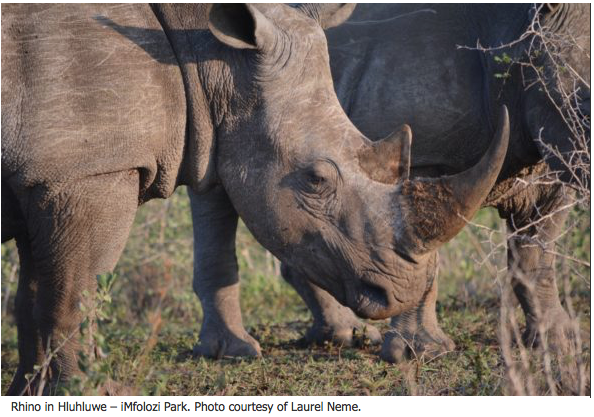 View this article: Justice for Rhinos—When Will It Come?